A man walks past the front entrance Sint Jacobskerk (St. James Church). Surely this Antwerp resident has seen the front of this church hundreds of times. But in reaction to my massive camera and tripod rig, it seems he double checked for any unusual reason I would be photographing this edifice. A cursory glance and he continued walking. In terms of local churches, this one ranks up there as a doozy. 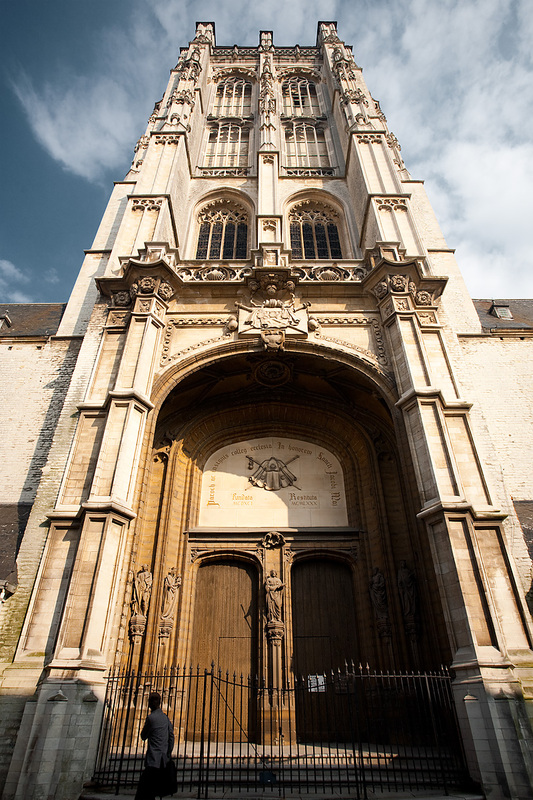 The inside of Sint Jacobskerk is historically the burial-place of Antwerp's most distinguished residents. I didn't recognize any of the listed names but one: Peter Paul Rubens, local boy done good (sic) and internationally renowned artist of his time. 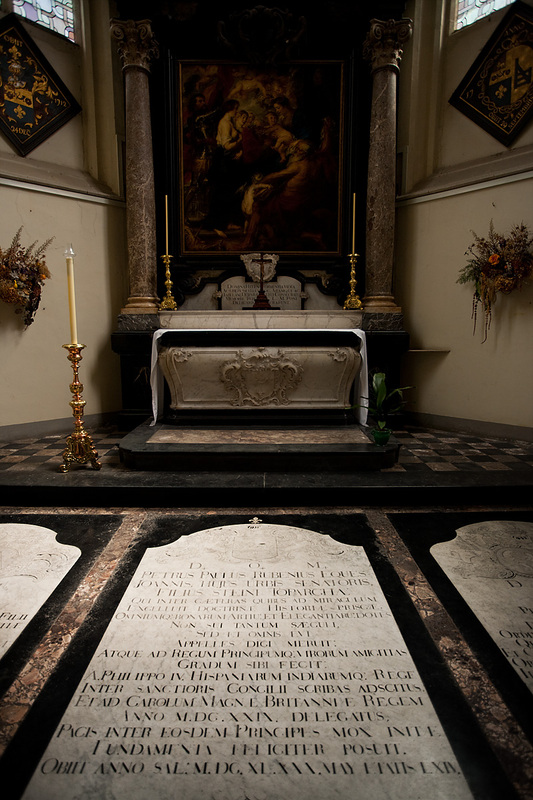 The chapel and burial place of the Rubens clan inside Sint Jacobskerk. Here lies the body of Peter Paul Rubens, with writing completely incomprehensible to the illiterate masses of today. Hopefully Google translate will release a Latin -> English online translator soon to verify if I've photographed the correct tomb in which Peter Paul Rubens is buried. I pray this inscription on the floor isn't a directive saying Rubens' body is buried in the raised tomb ahead or worse, has been moved to an undisclosed location. For a country full of perfect English speakers, the Belgians sure don't label much in English outside the most important tourist attractions. Operating a non-commercial website on biographies and graves of famous people from around the world (www.knerger.de) I came across your photos. My question is whether you would kindly allow me to use your photo of Ruben's tomb. He is indeed encased in the marble sarcophagus, probably inside a lead coffin as well.